Full Day: £10 Early Bird (before Dec 12), £12 after. Afternoon event only: £6. Evening event only: £7.50. Delia Derbyshire Day 2013 is a special day and evening event of performances, screenings and talks celebrating the work of the fascinating electronic pioneer Delia Derbyshire, who is best known for creating the original BBC Doctor Who theme tune in 1963 using all electronic production. Evening event will present new commissions by Manchester based caro c (experimental electronic), Ailís Ní Ríain (contemporary classical) and Naomi Kashiwagi (gramophonica) inspired by spending time with Delia Derbyshire archives held at University of Manchester. Plus DJ Tukatz playing Delian sounds and live visual accompaniment by Kara Blake. 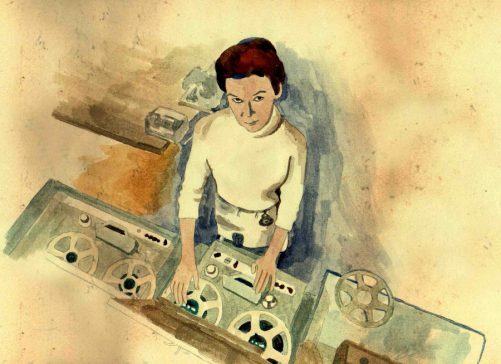 Delia Derbyshire Day 2013 from Delia Darlings on Vimeo. This event will begin at 3pm. SPECIAL EARLY BIRD OFFER! Buy your day tickets for just £10 before December 12th. The Delian Mode – trailer from Philtre Films on Vimeo.